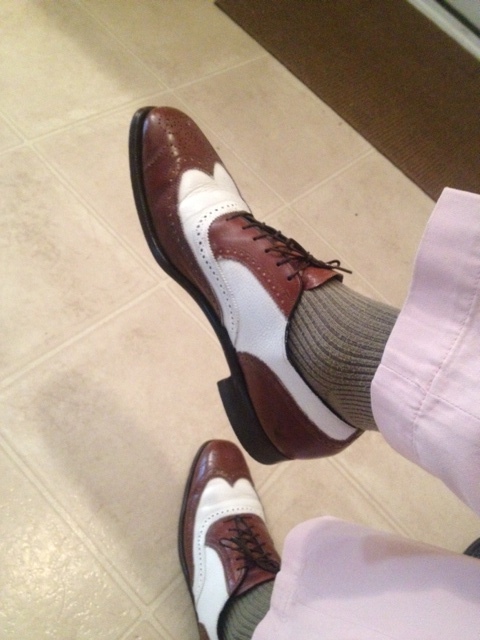 Brown and white spectator wingtips by Johnston and Murphy. Ribbed cashmere green socks by Club Room. Pink neck tie is a thrifting find. Green striped spread collar dress shirt is by Banana Republic. 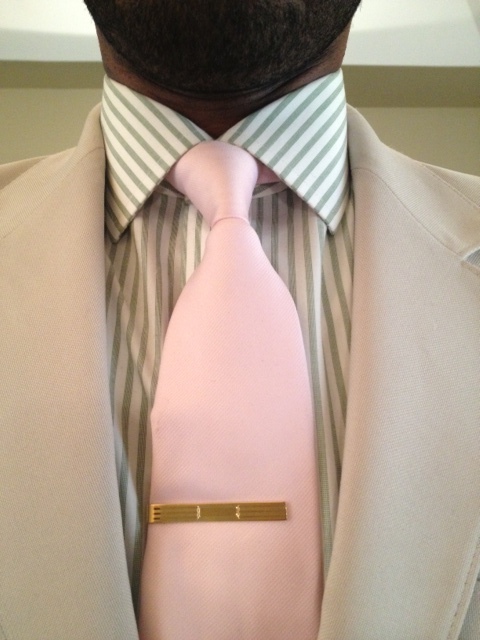 Gold tie bar is by Brooks Brothers. 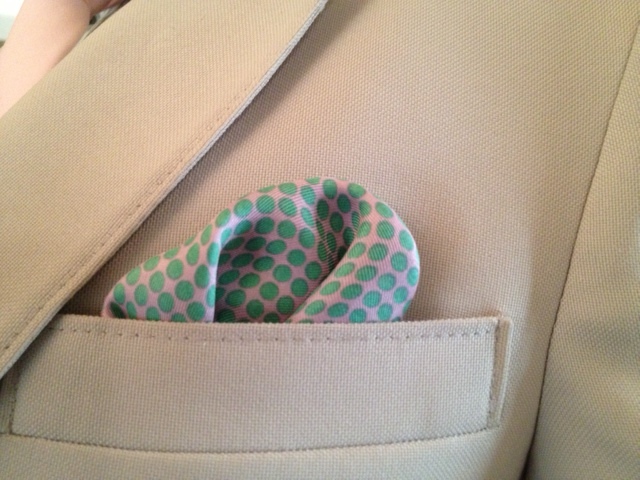 Silk pink and green polka dot pocket square is a thrifting find. Cream blazer that features gold buttons notch lapels, patch pockets, two button closure, rear center vent, and full interior lining is a thrifting find. Pink flat front trousers are by Ralph Lauren. 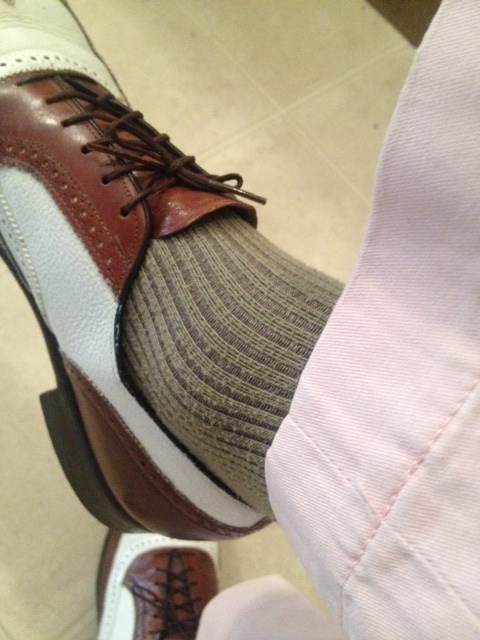 This entry was posted in Uncategorized and tagged Banana Republic, Banana Republic striped dress shirt, brooks brothers, Brooks Brothers gold tie bar, brown and white spectator wingtips, Charlotte Style, Club Room, Cream blazer with gold buttons, Johnston And Murphy, Johnston And Murphy spectator wingtips, NC Style, Pink Polo pants, Ralph Lauren, Ralph Lauren pink trousers, ribbed cashmere socks, Spectator wingtips, Wilbur Dow by wilburdow. Bookmark the permalink.